Bishop Erkolano Lodu Tombe, President of Caritas South Sudan and Bishop of Yei, will be in Rome from 21 March for a meeting of South Sudan experts to discuss the worsening crisis in his country where famine has been declared in the midst of civil war. Trócaire repaired a bore hole recently in the village of Adior, Adior County, South Sudan. It was 20 years old and broken down. Photo by Sean Farrell/Trocaire. The high-level meeting at Caritas Internationalis in Vatican City will aim to plan a scaling-up of the emergency response in an enhanced cooperation across all Caritas agencies in the region. Currently 1 million people are in imminent danger of famine in South Sudan and in total 5.1 million are in urgent need of food and livelihood help. At least 270,000 children are suffering acute malnutrition. The global Catholic aid network Caritas has a long-term presence in the country and operates across all seven dioceses with access to remote rural areas. However, more funds are needed as well as stable conditions to allow the delivery of aid. This week’s Rome meeting will set a framework for these severe operational challenges as well as setting direction for Caritas South Sudan over the next three years to 2020, with a focus on the church’s advocacy work for peace. “We must have an immediate stop to the violence and free movement of our people, with safe passage for aid workers to bring urgent assistance and unhindered distribution of aid supplies,” says Bishop Tombe. There are 144,000 displaced people in the bishop’s state alone, which is seeing violent attacks in rural areas, people deserting their villages, and crops and homes being destroyed in a famine caused by civil war and a mismanaged, corrupt economy. In all, 3.4 million South Sudanese have been forced from their homes since the start of the civil war in 2013, of whom 1.3 million have left the country as refugees. Bishop Tombe, whose church compounds have harboured thousands of vulnerable people seeking refuge from violent attacks, has declared himself ready to risk travelling into the bush to talk to rebel forces and find out their grievances. “Our people are living in fear,” states the bishop. 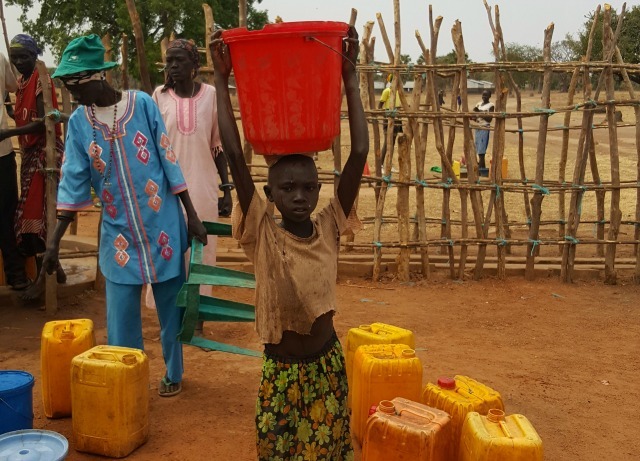 “We need peace.” In a hard-hitting pastoral letter he and the other Catholic bishops of South Sudan have described the famine as “man-made” due to the country’s four-year civil war which sees daily atrocities being carried out against civilians. “They are killed, raped, tortured, burned, beaten, looted, harassed, detained, displaced from their homes and prevented from harvesting their crops,” states the 23 February letter. Bishop Tombe and his fellow pastors have longed called for the international attention that is only now turning to the country with the UN’s declaration of famine. “People in South Sudan have been dying amidst the deafening silence of the media,” he told a local news outlet in December. The bishop has also spoken out against the mistreatment of civilians in Yei town by government SPLA soldiers and of being blocked by them from travelling to his parishes around Yei for Sunday Mass. For more information please contact Myra Soetandyo at soetandyo@caritas.va or call +39 06 698 79 724.